The excerpt settings are located in the Theme Panel > Excerpts. 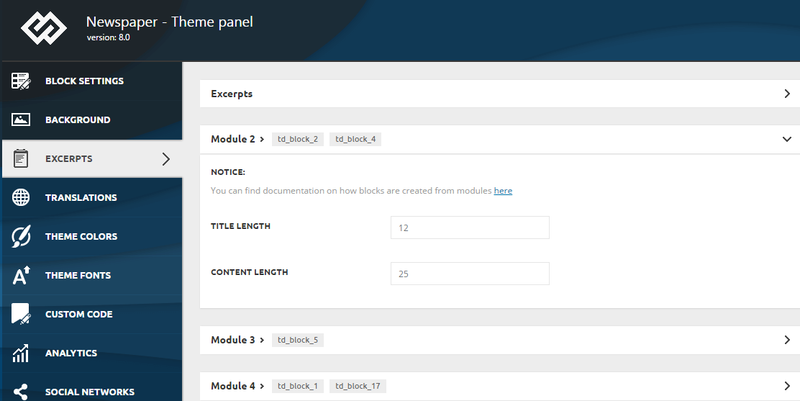 From here you can customize the length of the title and content excerpt for modules/blocks. On Letters – in some languages the word detection function may not work. You can switch it to letters. Note: If your site contains articles written in a language that doesn’t use spaces between words, using On Word excerpt type will make the theme display your whole text content as an excerpt to the post. Please choose On letters option and set the number of letters you want to display as an excerpt to the posts. Title length – available on all modules, it changes the excerpt length for the post title. Content Length – it’s available in modules which come with a content excerpt. It changes the excerpt length. Note: If you edit a post and add a text as excerpt manually (in the excerpt box), the theme will show that text unmodified and uncut.